Powers/Abilities: His brain capable of instantaneously processing vast amounts of information, Mentor can calculate his opponent's weakest spots and easily strike them down. “My power makes me so smart, I can calculate my opponent's weakest spot - and defeat him by striking there with alacrity.” Mentor is also apparently very long-lived, as he appears to have been part of the original Imperial Guard hundreds of years ago. Mentor has used a Shi'ar anti-gravity device to fly. It is unknown if his abilities are possessed by his entire race or solely him. Mentor can receive intel-feeds in his brain, can quickly decipher the meanings of alien languages and technologies, and can use nerve pinches to render foes unconscious. The full extent of his abilities is likely unknown. (X-Men I#107) - Members of the Imperial Guard fought the X-Men (Banshee, Colossus, Cyclops, Nightcrawler, Phoenix (Jean Grey), Storm, Wolverine) and Starjammers (Ch'od, Corsair, Cr+eee, Hepzibah, Raza) at the M'kraan Crystal, in order to stop them from rescuing Lilandra from D'ken and Davan Shakari. During the battle, Cyclops felled Mentor with an optic blast, and he was later hit by Storm's lightning. D'ken was rendered comatose and Lilandra took over as the new Majestrix. 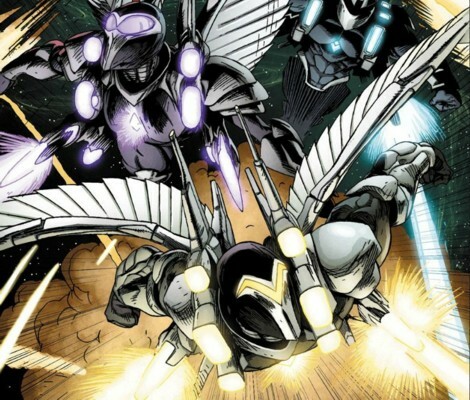 Members of the Guard in this mission: Astra, Electron, Fang, Gladiator, Hobgoblin, Impulse, Magic, Mentor, Midget, Nightside, Oracle, Quasar, Smasher, Starbolt, Tempest, and Titan. (X-Men I#108) - The Guard lay unconscious as the battle resolved. (X-Men I#109 (fb) - BTS) - The Guard was stopped by Lilandra from killing the X-Men. Later the Guard watched the X-Men return to Earth. (X-Men: Spotlight on Starjammers#2) - At Deathbird's orders, a large group of the Guard attacked the Starjammers and Excalibur (Captain Britain (Brian Braddock), Lockheed, Meggan, Nightcrawler, Shadowcat, Phoenix (Rachel Summers), Widget) on Earth, but they retreated when Deathbird was put at risk. Guard members who participated in this assault: Astra, Black Light, Blackthorn, Earthquake, Electron, Gladiator, Hobgoblin, Impulse, Magik, Mentor, Midget, Nightside, Oracle, Smasher, Starbolt, Tempest, Titan, and White Noise. (Uncanny X-Men#275) - The Imperial Guard was attacked by a group of Warskrulls posing as the Starjammers. The Guard seemed to be winning until the X-Men (Forge, Gambit, Jubilee, Psylocke (a Warskrull), Storm) joined the fight against them, and the Guard was quickly overwhelmed. Guard members in this mission: Earthquake, Gladiator, Mentor, Oracle, Smasher, Starbolt, Tempest, Titan, and Warstar. (Imperial Guard#1 (fb)) - Lilandra sent eight of the Guard to Earth to watch out for Kree militants and to protect the planet in the absence of its heroes (many of whom had been seemingly killed by Onslaught, a composite entity of Professor X and Magneto). Members on this mission included: Commando, Earthquake, Electron, Flashfire, Gladiator, Mentor, Nightside, and Oracle. They aided the Avengers (Black Widow (Natasha Romanova), Hercules, Quicksilver) against Primus and his People's Underground Militia. During the battle, though he was reluctant to fight, Mentor defeated an armored opponent by striking his weakest spot. When the Guard discussed their duties, Mentor claimed that the Shi'ar Empire could never be in danger without them. (Imperial Guard#1) - Mentor reported the actions of the Guard to the Shi'ar, though he was embarrassed by their actions. After some down time, during which Mentor watched Flashfire and Commando argue, the Guard battled the Militia again, but were defeated this time. Mentor was the last one standing. (Imperial Guard#2) - The Guard escaped, and discovered the Militia were Kree operatives. They fought the villains again and Mentor evaded on villain, causing him to crash into a pole. The Guard helped authorities clean up after the villains escaped. (Imperial Guard#3) - While tracking the Militia again, the Guard discovered that the Kree planned to detonate a Nega-Bomb. Mentor was concerned the Guard was getting too involved, but was reassured by Electron. After a deadly battle, they managed to stop the bomb from going off and defeated the Militia. To contain the bomb, Mentor had worked to calibrate his force fields to contain it, but had been unsuccessful, leaving the bomb to be destroyed by other means. The Guard allied with Rick Jones (who'd been powered by the Supreme Intelligence) and learned the Supreme Intelligence was on Earth. (Inhumans IV#4) - Lilandra represented the Shi'ar Empire on the planet Kritnah in the marriage ceremony with Emperor Eson of the Spartoi while the Imperial Guard stood by. Black Bolt moved to attack Lilandra, who set up a shield and activated the Guard against the Inhumans. When it seemed Black Bolt had slain Lilandra, Hussar briefly battled Medusa. The Inhumans teleported away, escaping. Lilandra's form was revealed to be Hobgoblin, who appeared to be dead. Lilandra, as a hologram, revealed herself and told the Spartoi that the union was off due to their atrocities. Jason of Spartax was blamed for being behind it. Members of the Guard in this mission: Astra, Delphos, Earthquake, Fang, Flashfire, Gladiator, Hobgoblin, Hussar, Impulse, Mentor, Neutron, Nightside, Oracle, Smasher, Starbolt, Titan, Warstar, and others. (Uncanny X-Men#477 - BTS) - The Imperial Guard was dispatched to defeat Vulcan, who'd been destroying ships in Shi'ar space. (Uncanny X-Men#480) - The Guard finally defeated Vulcan (keeping him alive at the orders of K'tor) after a deadly battle which left some Guard members, including Cosmo, Impulse, Smasher, and Titan, seemingly slain. Guard members in this mission: Astra, Cosmo, Electron, Gladiator, Hobgoblin, Impulse, Manta, Mentor, Neutron, Nightside, Oracle, Plutonia, Scintilla, Smasher, Starbolt, and Titan. (Uncanny X-Men#485) - Members of the Guard stood guard at the wedding of Deathbird to Vulcan, D'ken acting as new emperor having ordered it. The X-Men (Darwin, Havok, Marvel Girl (Rachel Grey), Polaris, Warpath), Starjammers (Ch'od, Corsair, Cr+eee, Hepzibah, Raza), Korvus, Lilandra, and the armies of General Ka'ardum attacked, and the Guard fought against them. Vulcan then assassinated D'ken. (Uncanny X-Men#486) - Vulcan murdered Corsair and proclaimed himself emperor. Deathbird ordered the Guard to follow Vulcan's orders, and they were soon ordered to retreat. Guard members in this mission (and last): Earthquake, Electron, Gladiator, Magique, Manta, Mentor, Nightside, Starbolt, and Warstar. (X-Men: Emperor Vulcan#4) - During a war with the Scy'ar Tal, the Imperial Guard teamed with temporary allies the Starjammers (Ch'od, Korvus, Marvel Girl (Rachel Grey), Polaris, Raza) at the order of Vulcan. At one point in the battle, the Starjammers were narrowly saved by Gladiator, Mentor, Oracle, and Nightside. (X-Men: Emperor Vulcan#5) - With Earthquake seemingly dead, Mentor analyzed the Finality weapon and determined its capabilities and superior functioning. Vulcan ordered that it be used on the remaining Scy'ar Tal. The Scy'ar Tal were finally destroyed after Mentor activated the weapon, even though Havok managed to destroy the Finality weapon. Deathbird lead the rest of the Imperial Guard and defeated the Starjammers, then teleported back to save Vulcan from Havok. The Imperial Guard (Electron, Flashfire, Gladiator, Manta, Mentor, Nightside, Oracle, Plutonia, Scintilla, Titan, Warstar) stood by Deathbird, Araki, and Ka'ardum as the Shi'ar cheered on Vulcan. The Starjammers (Ch'od, Havok, Polaris, Raza) lay captive. (X-Men: Kingbreaker#4) - Joined by Smasher (Salac Tuur), the Guard fought off the Starjammers, who eventually escaped after putting Deathbird into a coma. During the battle, the Hodinn and Pn'zo were killed. Later, Oracle, Mentor, and the Strontian stood by Ka'ardum and Vulcan later as Deathbird received medical treatment. Vulcan authorized the Imperial Guard to join the military in expanding the Shi'ar empire. (War of Kings#1) - Vulcan surveyed, with Gladiator, the assembled Imperial Guard. Mentor reported they were all battle ready and Vulcan announced his intentions to attack the Kree. They soon engaged in a massive battle with the Inhumans and Starjammers, successfully capturing Lilandra before retreating. During the battle, Mentor took down Lilandra with a nerve pinch and Voyager escaped with her through a portal, which sliced of Ch'od's hand. Members of the Guard in this mission: Astra, Black Light, Earthquake, Electron, Fang, Flashfire, Gladiator, Hussar, Impulse, Magique, Manta, Neutron, Nightside, Plutonia, Schism, Scintilla, Shapeshifter, Smasher, Squorm, Starbolt, Titan, Voyager, Warstar, and White Noise. (War of Kings#2) - Ka'ardum stood by with Gladiator and Mentor when Vulcan confronted the captured Lilandra. Ka'ardum soon reported to Vulcan that a fleet had been destroyed. Vulcan furiously promised to kill every enemy, starting with Lilandra. 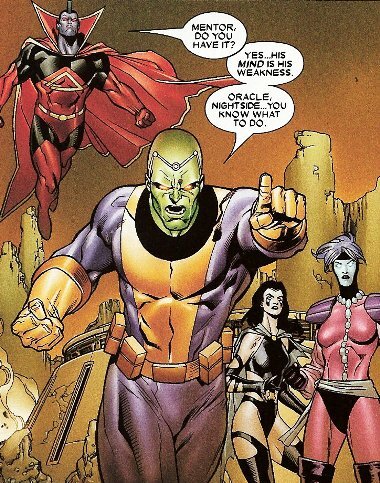 (War of Kings#3) - Mentor and Voyager watched as Vulcan was held back by Araki and Gladiator from killing Lilandra as they feared her death would give her followers a reason to rally around another figurehead. (Guardians of the Galaxy II#14) - As Warlock battled Vulcan, the Imperial Guard (Fang, Mentor, Oracle, Scintilla) rushed to help, seeking Magique for aid when they realized Warlock wielded magic. They attacked, with Neutron and Hussar joining them, and Magique put Warlock in a glamour snare, but he easily dispelled it and painfully drained her glamours from her. Vulcan was furious with them when Warlock escaped, but Oracle sensed Magique had marked him with a witch-mark, with which they could track him. They followed to Knowhere, using Voyager to transport them, and found a battle breaking out between the Guardians of the Galaxy (Gamora, Jack Flag, Mantis, Martyr, Moondragon, Star-Lord, Warlock) and the Inhumans (Black Bolt, Crystal, Gorgon, Karnak). (Guardians of the Galaxy II#15) - The Imperial Guard (Fang, Hussar, Magique, Mentor, Oracle, Scintilla, Voyager) landed on Knowhere, where the Inhumans and Guardians of the Galaxy were already battling. As Fang was hit by a mental blast from Cosmo the telepathic dog, Mentor ordered the Guard to kill Black Bolt. After Oracle knocked back Cosmo's telekinetic barrier, Black Bolt knocked them back with a small scream and the Inhumans teleported off-site through Lockjaw. Mentor ordered the Guard, with their Shi'ar operatives, to separate and find Warlock and the others, knowing Voyager's needed time to recuperate before seizing reinforcements. Intending to seize Knowhere for the Shi'ar, Mentor examined Knowhere's technology while Hussar kept him appraised of the battles with the Guardians. As Mentor prepared to teleport in reinforcements through Knowhere, a group of Guardians attacked him, and Rocket Raccoon leapt on his face, slashing it. As Drax violently defeated Fang, more Guardians arrived as backup. Hussar ordered Voyager to aid them in retreat, even as Mentor informed Rocket that Lilandra had been assassinated, a message he'd heard through intel-feed. Magique was killed in battle. (Nova IV#25) - Mentor tortured Tarcel, taunting him though he continued refusing to give any information. Vulcan stepped in and increased the torture. (War of Kings#4) - As Titan, Mentor, Fang, and Hussar stood by, Vulcan tried checking in with Araki, but communications continued failing after the recent Nega-bomb usage. (Realm of Kings: Imperial Guard#1) - When the planet of Izumbard refused to create more warships for the Shi'ar, the Imperial Guard (Commando, Earthquake, Electron, Fang, Flashfire, Hussar, Manta, Neutron, Plutonia, Starbolt, Titan, Voltar, Warstar) were sent to quell the riots. The new praetor, Mentor, surveyed the fights across the world, and let Gladiator know that he had things under control. After the battle ended (though Voltar was killed), Mentor stood by while Gladiator was chastised by the chancellor for entering the fight. A group of the guard were fighting in the barracks when Mentor, Smasher, and Oracle interrupted the fight. Mentor told them that they'd just volunteered for a special strike force mission due to their bad behavior. The next day, they learned they'd be going for recon into the Fault, the rip in time and space, alongside Ch'od and Raza of the Starjammers. (Realm of Kings: Imperial Guard#2) - After being briefed by Gladiator, the Imperial Guard (Fang, Flashfire, Hussar, Manta, Mentor, Neutron, Oracle, Plutonia, Smasher, Starbolt, Warstar) were sent into the Fault to investigate, with Ch'od and Raza among them. When Mentor and Smasher made changes to the operating systems of the Starjammer, Ch'od was furious and tried to frighten Mentor, who logically talked his way through Ch'od's threats. The ship was soon under attack by energy leeches and the crew struggled to stay in the air. When one breached the ship, Mentor ordered Warstar not to fire on it, but to instead trap it in a force field, in which the creature fed upon itself. Mentor recommended the ship run on silent so as not to attract more leeches, and Ch'od reluctantly agreed. Within minutes, a giant ship approached, and they prepared the Starjammer for battle. The ship, bio-organic in nature, fired on them, and then caught them in a tractor beam, pulling it inside. As they battled off biological monsters, Oracle surmised they were aboard a rotting corpse that was seeking to use its enzymes to kill them. (Realm of Kings: Imperial Guard#3) - Over the following six hours, as the dead ship grew around the Starjammer, the Guard worked to repair their ship. Oracle soon discovered the ship had been killed while running from something else. As enzymes attacked them, they realized they need to rush away before they were digested. As the ship was nearly overwhelmed, Starbolt and Flashfire got back and burned the monsters up. Using Starbolt to power the ship's engines and Flashfire to trigger an autonomic response in the ship (causing it to open its jaws), Mentor successfully piloted the Starjammer free. Mentor then fell into a deep sleep, awakening hours later. They soon came across a massive field of debris. They followed an energy signature, hoping to find Vulcan, when Warstar and Neutron were hit by a massive energy burst. When the air cleared, they saw Quasar (Wendell Vaughn) there, with a massive biological entity pursuing him. (Realm of Kings: Imperial Guard#4) - Mentor recorded in his Praetor's log about their being surrounded in a debris zone by a fleet of Xenoform vessels. Oracle, through strain, worked on sending her message through the M'Kraan using Quasar's quantum powers, a strategy devised by Mentor. Many of the members shared a final toast before the alien beings arrived aboard their massive ship and began moving through the mines. On the ship, worried for his health, Plutonia brought Mentor a nutrient drink and tried to confess her feelings for him, but he ignored her, too distracted by their mission, and she rushed off. Ch'od soon let Mentor know that someone had sabotaged the ship's hyperdrive capacitor, and Mentor soon realized it was Smasher. When Smasher returned, Oracle tried reading his thoughts and realized she couldn't. Plutonia soon took two amulets out of Smasher's hands and he furiously attacked Ch'od and Raza, demanding the amulets. He explained that he was one of the Fraternity of Raptors, not the one who assassinated Lilandra (that was Darkhawk, an earthling) and that his race had been involved in setting up the Shi'ar Empire for thousands of years. He said that he could give them major firepower for the coming battle if they let him have the amulets back. Outside the xenoform beings attacked in the form of the X-Men and Starbolt was quickly killed in battle. Gladiator then arrived to aid them. (Realm of Kings: Imperial Guard#5) - The two sides of the Guard savagely attacked the aliens, killing them swiftly and decisively. Mentor soon reported to Gladiator that "an abominable universe of reciprocal otherness" was upon them from the other side of the Fault, full of cancerous aggression and new physical laws. Talon then ensured them that using his amulets would allow them to create two more Raptor beings, and Mentor and Plutonia volunteered, becoming Strel and Kyte respectively. During the battle, Black Light and Neutron were killed. The combined Guard narrowly escaped a savage telepathic attack when Ch'od and Raza launched the Symbiote (formerly of the Praetorians) at the Xavier being the attack had originated from. After they successfully escaped, Gladiator reported their success to the Inhumans, and announced the pending war with the Fault universe. A new female Mentor was later assigned to the Guard. (Ultimates II#3) - The Shi’ar ship Bry’nath orbited Archeopia and the Imperial Guard (Mentor, Oracle, Smasher (Izzy Kane) investigated, finding it brimming with life due to the actions of the transformed Galactus; Oracle found the truth by expanding the outer limits of her powers to read recent psychic history. Gladiator called Alpha Flight, furious. (Guardians of the Galaxy: Mother Entropy I#4) - When the Guardians of the Galaxy arrived on Shi'ar Prime, they were initially imprisoned by Gladiator. Mentor, of the Imperial Guard, and Gladiator saw Mother Entropy attack, and she infected them, taking over their forms. (Guardians of the Galaxy: Mother Entropy I#5) - Groot freed the infected, including the Imperial Guard (Gladiator, Mentor). Comments: Created by Chris Claremont, Dave Cockrum, and Dan Green. Mentor is pictured in OHotMU I#5 and has a partial entry in OHotMU Deluxe Edition#6. The Imperial Guard was a takeoff of DC's Legion of Super-HeroesThe Imperial Guard was a takeoff of DC's Legion of Super-Heroes. 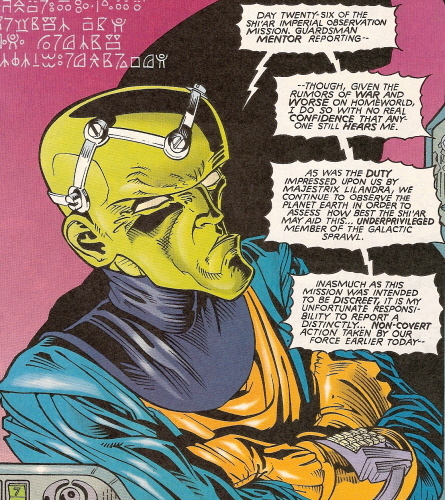 Mentor is based on the DC character Brainiac/Vril Dox/Querl Dox. Thanks to Per Degaton for pointing out Mentor's missed appearance in Uncanny X-Men#275. Mentor was also one of the Imperial Guard members active in the novel X-Men: Empire's End by Diane Duane. It has to be seen if this story is canon. At the end of Realm of Kings: Imperial Guard#5 after her predecessor adopted the identity of Strel, the newly appointed female Mentor joined the Imperial Guard on the planet Elysialla VII (the mausoleum world of the Guard) to mourn the fallen Imperial Guard members. Though we don't know it for sure the Mentor that served centuries ago with the Imperial Guard most likeley was a predecessor of the Mentor profiled here. (Uncanny X-Men#479 (fb) - BTS) - The first Imperial Guard was formed centuries ago to fight Rook'shir, possessor of the Phoenix force (also called the Phal'kon). Among its first members were Gladiator, Magic, Mentor, and Quasar. (Uncanny X-Men#479 (fb)) - The Guard apprehended Rook'shir, and Gladiator beheaded him.